You use it to organize your contacts, keep on schedule, and remember your anniversary—but most importantly, you use it to communicate quickly and effortlessly with others. Microsoft’s Entourage 2008( ; $400 as part of Office 2008) is one of the most powerful and full-featured e-mail clients available. But with a few tweaks, you can make it even faster and make easier to keep on top of your messages. 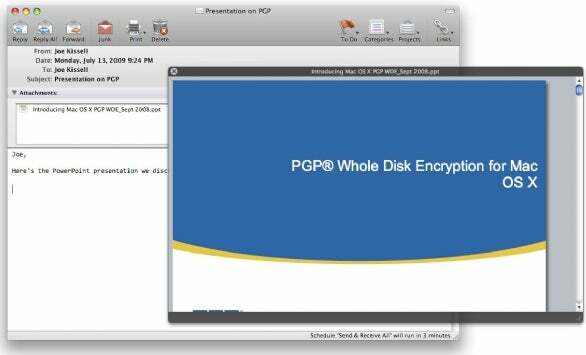 Introduced in OS X Leopard, Quick Look lets you instantly preview files, such as graphics, videos, PDFs, and Microsoft Office documents, without having to open them in a separate application. Apple Mail has built-in support for Quick Look, allowing you to view attachments easily, but Entourage does not. However, thanks to pair of free add-ons, you can add Quick Look capabilities to Entourage. To use Quick Look to view Entourage attachments, download the Quick Look Attachments script and move it to /Users/your_username/Documents/Microsoft User Data/Entourage Script Menu Items. Once it’s installed, you can view attachments using Quick Look simply by selecting the message and pressing Control-L, or by choosing Quicklook Attachment from Entourage’s script menu. You can also use Quick Look to view Entourage messages in the Finder (this only works with Entourage 2008). Ordinarily, if a Spotlight Finder search were to turn up an Entourage message (classified under the Kind column as vrge08message ), you would have to double-click on it and open Entourage to view its contents. But to read these messages within the Finder, download the Entourage QuickLook Plug-In and store it in the QuickLook folder in /Users/your_username/Library (create one if it doesn’t already exist). The next time your Spotlight search results include an Entourage message, simply select it and press the spacebar to preview it. By using the Quick Look AppleScript, you can get fast previews of Entourage attachments, without having to open a separate program. By default, Entourage displays mailboxes on the left, your message list in the center, and a preview pane (showing the contents of the selected message) on the right. However, you may prefer a different arrangement. To display the preview pane below the message list, choose View -> Preview Pane -> Below List. Or, if you have a very full in-box, you might want to hide the preview pane altogether (View -> Preview Pane -> None). If you like reading messages using the preview pane, but you don’t appreciate having Entourage mark selected messages as read, you can easily disable this behavior. Go to Entourage -> Preferences, click on Read under Mail & News Preferences, and uncheck the Mark Messages As Read When Displayed In The Preview Pane box. Entourage will now leave selected messages as unread. When you create a new message and start typing a name or address in the To, Cc, or Bcc field, Entourage looks for any match in its address book, whether it’s a first or last name, or e-mail address. Save yourself some typing (and the extra few seconds it takes to scan through potential matches) by setting up nicknames for your most frequently used contacts. Entourage stores all of its data—for instance, e-mail, contacts, and calendar entries—in a single database file (located in /Users/your_username/Documents/Microsoft User Data/Office 2008 Identities/Main Identity). This file can grow quite large over time, and even if you delete messages or other data, the file doesn’t shrink proportionally. To save disk space and enable Entourage to work more efficiently, you should compact this database every few months (this reorganizes its contents internally). First, quit all Microsoft Office programs. Hold down Option while launching Entourage to bring up the Database Utility. You have a couple of choices: Select Compact Database to compress and optimize the data, or Repair Database to also fix any errors, and then click on Continue. The process should take a few minutes, though it may be longer if you have a large database. When it’s complete, click on Done and then Quit. 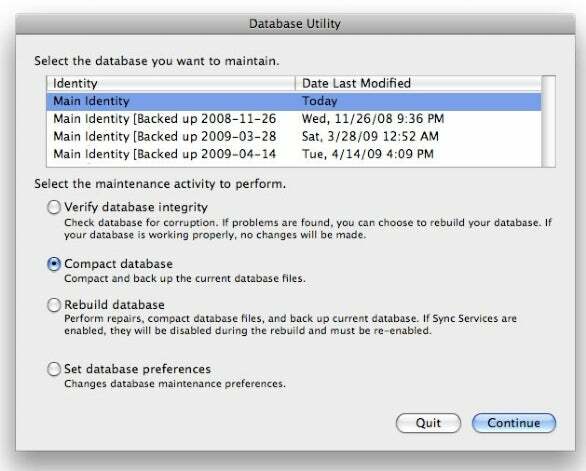 This process stores a backup copy of your database in /Users/your_username/Documents/Microsoft User Data/Office 2008 Identities/Main Identity [Backed up date and time]. Once you’re satisfied that Entourage is working properly, you can delete the backup, if you wish. This hidden utility lets you compact or repair the Office database—just hold down Option while launching Entourage. Despite the fact that Entourage includes built-in spam-filtering features, you may still wind up deleting a good deal of junk mail. Unlike Mail, Entourage’s junk filter doesn’t learn. In other words, doesn’t automatically refine its spam filtering as you use it. If the amount of spam you receive is overwhelming your in-box, download C-Command Software’s $30 SpamSieve ( ), which has a well-deserved reputation for accuracy. After installing SpamSieve, follow the instructions for turning off Entourage’s spam filter, installing the SpamSieve scripts, and setting up rules so that Entourage uses SpamSieve as its junk filter. Once that’s done, you’re ready to start training. If a spam message appears in your in-box, select it, go to the script menu, and choose SpamSieve - Train Spam (or press Command-Control-S) to delete it and update SpamSieve’s filter. If SpamSieve incorrectly classifies a good message as junk, select it from your Junk E-Mail mailbox and choose SpamSieve - Train Good from the script menu (or press Command-Control-G). After training, you should find Entourage’s anti-spam accuracy improves to nearly 100 percent. Senior Contributor Joe Kissell is the senior editor of TidBits and author of numerous e-books about OS X.